Wow, did December just fly by?! Seems like yesterday I was setting my goals for the month and today we are wrapping up the year. So how’d I do? I’d give myself 75%. 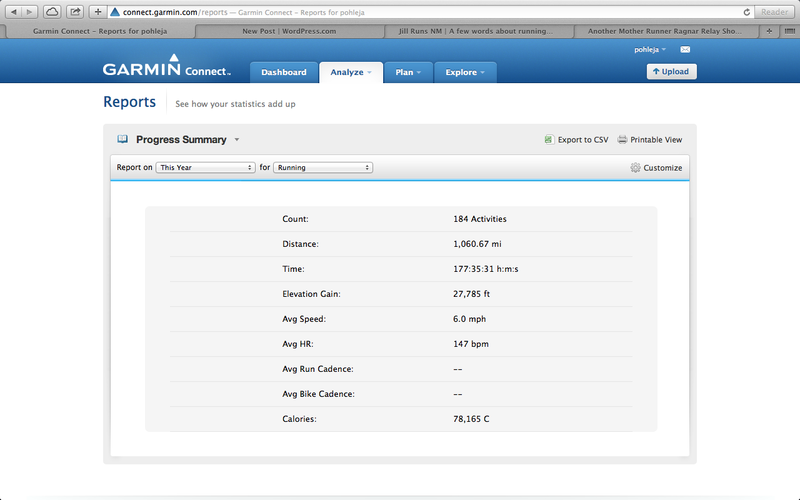 Goal 1: Hit 1,000 miles for the year. I did it! And with one more run on tap with my running friend, Ceci, I hope to end the year at 1,065! Goal 2: Stay Healthy. I’ve worked hard this month at really listening to my body and not over doing it (see Goal 3). I have been doing a lot of foam rolling, stretching and self massage on my shin splint and it is feeling much better than the beginning of the month, although not totally healed. At the beginning of December I still was holding out hope that I would be able to complete the full marathon at Phoenix Rock and Roll. I really, really wanted to cross that finish line and had even given up all time goals just to be able to say that I had done it, but then I went in to my local running store (Heart and Sole) to buy a new pair of Mizunos. I just love this running store and the people that run it – they are very experienced and always have great advice. I started telling them about my injury problems this fall and how RnR was coming up and that I wasn’t sure what to do. They reminded me that I have many, many years ahead of me and why push my body beyond what it is ready to do and risk further injury? (This advice was accompanied by their own stories of ‘pushing beyond their limits’ and ending up hurt for months afterwards). So that sealed the deal for me. I needed someone to talk me down from the full marathon and they did. I am now signed up for the half marathon on January 19th, and have been training as such. Looking forward to earning one of these in a couple weeks! Goal 3: Complete the Runner’s World Holiday Streak. I loved, loved, loved doing the Holiday Run Streak last year. It kept me focused through the busy holidays and got me out the door even when it was cold out. This year was different, though. I already had a goal – get to Rock and Roll without further injury – and after two weeks of streaking, I decided to take a break. I was feeling worn down and tired and I knew if I pushed through the month of December running everyday I would be burnt out in January. As I look back on the decision, I think this has shown my growth this year. Last year I wouldn’t have stopped. This year, I have learned that I am not invincible and injury can happen. I’m ending the month stronger than I started, and I attribute that to having a few rest days here and there. Goal 4: Complete the Run Chat Holiday Scavenger Hunt. I absolutely loved doing this Scavenger Hunt this month. It kept my runs interesting and forced me to run some new routes to find some of the items on my list. My favorite run was when I had just three more things on my list – I knew where I could find the items, but they weren’t in the neighborhoods I normally ran in, so I set off on my adventure. 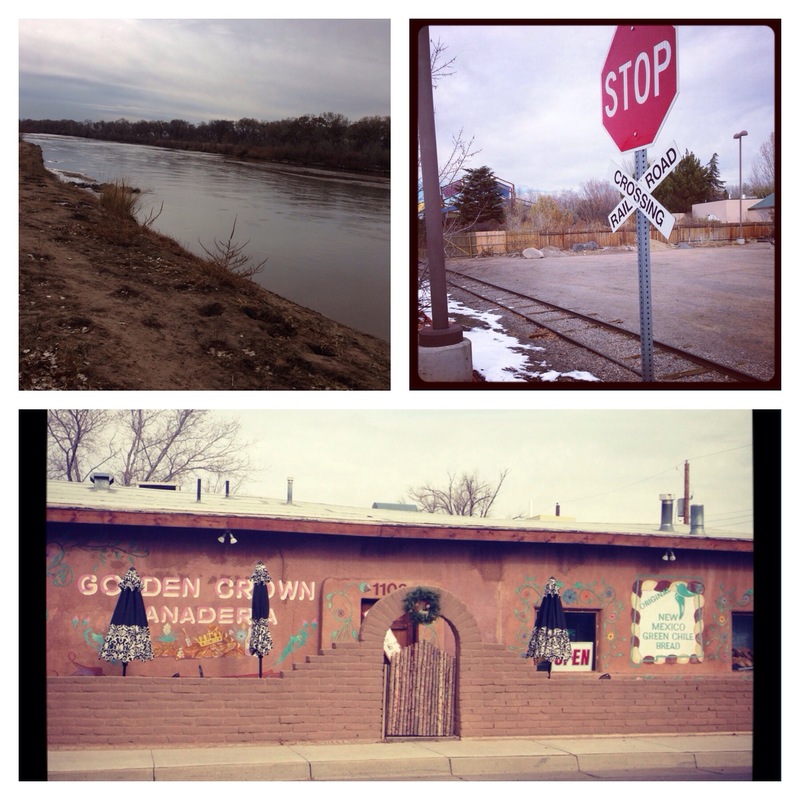 I needed to find a body of water, a railroad crossing and a local coffee shop. What I thought would be a 3-4 mile run, ended up being 7 miles that flew by. While I didn’t win any of the prizes from this contest this round, I connected with some new runners via twitter and instagram and looking forward to their next hunt this spring. That is my December in a nutshell. 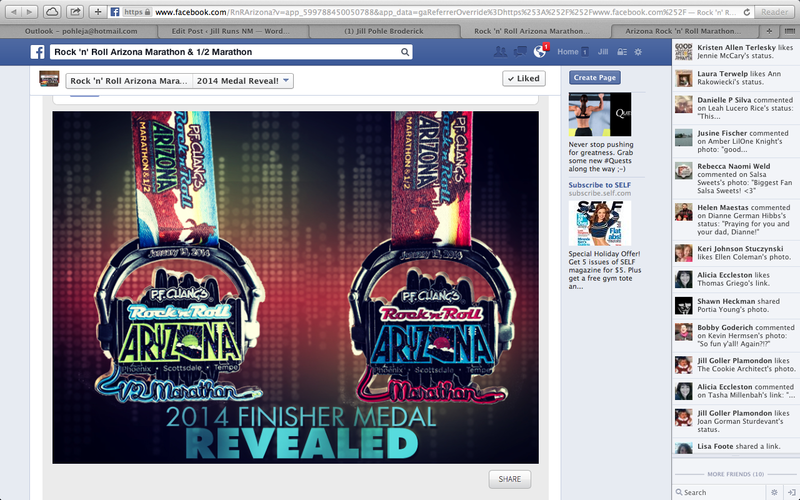 Accomplished most of my goals, stayed healthy, am on the road to Phoenix and am looking forward to setting my 2014 running goals. Let me just close with this one last snippet about running goals. My 6 1/2 year old daughter loves to hear about how far my husband and I run and is always asking about how far a 5k, 10k, half and full marathon are. She has completed four 5k runs this year – some running, some walking – and really enjoys crossing a finish line. This week she decided she wanted to up the ante. 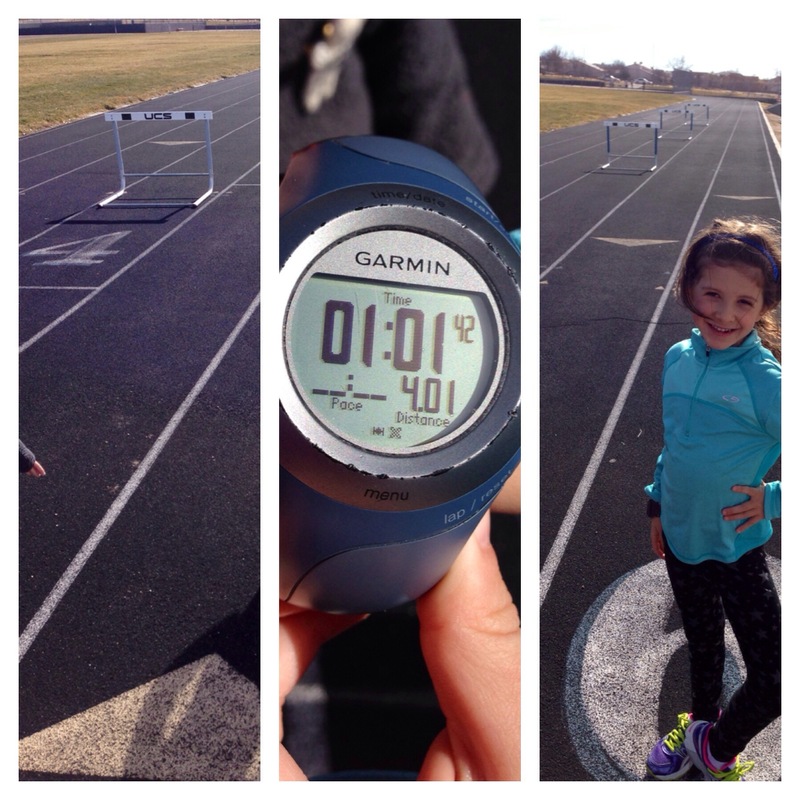 She wanted to go to the track and try to run 4 miles. On Sunday morning, I took her up to the local high school, strapped my Garmin to her arm and told her she needed to complete approximately 16 laps to hit 4 miles. I didn’t really think she would complete it and reminded her every time she passed me that if she was tired it was ok to stop. Well. She did it. She didn’t run the whole thing, taking several walking breaks, but she did complete all 4 miles. She was so happy and proud, and it reminded me about what makes goal setting so important. Setting goals for yourself pushes you beyond what you think you can accomplish. It makes the impossible seem possible with the right training. My daughters enthusiasm and belief in herself was so innocent and beautiful. It will be something that sticks with me during those hard training runs this coming year. Believe and you can do it.